The new Rivale 56 yacht from iconic Italian brand Riva is a combination of simplicity, elegance, and advanced technology. 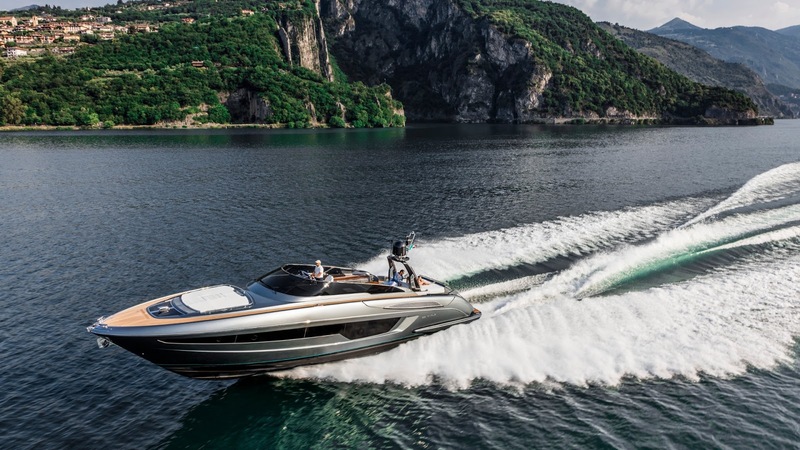 The new Rivale 56 arrived with the kind of fanfare that only Riva is capable of. Last weekend, 300 guests sat on the shores of Lake Iseo, historic home of the 175-year-old boat maker. The evening began with a gourmet dinner from Massimo Bottura, chef of the three-Michelin-starred restaurant Osteria Francescana. 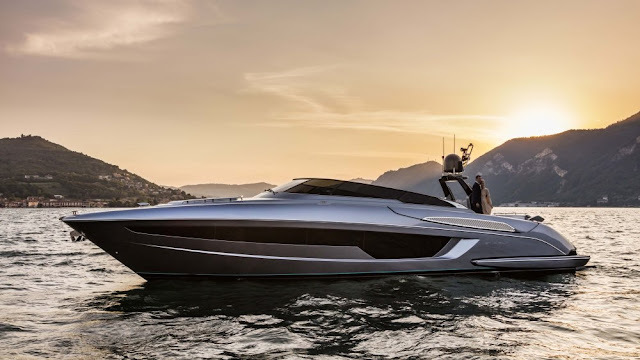 On the water, a broad, floating wall of 20-foot-high mirrors, with ballet dancers fluttering back and forth across the tops, parted to reveal the evening’s star, the new Rivale 56. The Rivale, with its shark-gray exterior and bright-black accents, cruised toward the crowd to thunderous applause, finally coming to the dock. The beautiful new Rivale actually didn’t need the Broadway-style entrée. The 56-foot yacht would be a stunner in the most ordinary setting, with a long, lean profile, full wraparound windshield, and black-tinted windows running along most of the hull. Arguably the most elegant performance yacht the Italian builder has launched in years, the Rivale is uncomplicated but refined, with some of the finest-quality details of any yacht its size. The cockpit has a double-size white sunbed at the stern under the black roll bar, and long, matching lounges to port. On the opposite side sit a wet bar and galley. Teak defines the cockpit sole and walkways to the bow, leading to more double sunbeds. 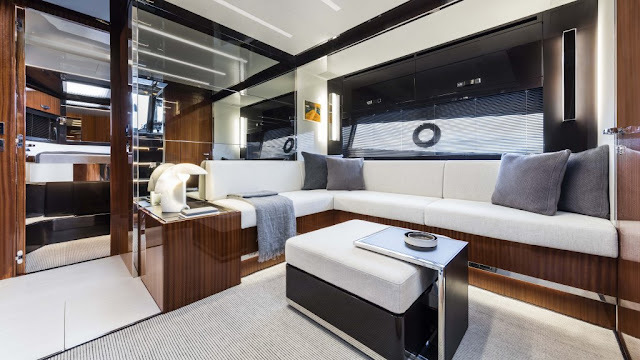 Officina Italiana Design and Ferretti Group’s Product Strategy Committee did a masterful job installing complicated technical details into the boat, while maintaining its simple elegance. The swim platform submerges underwater to allow the Williams Turbojet 325 tender to be unloaded. When the swim platform is down, additional steps on the portside appear to allow people to climb from the water without a stainless-steel ladder. It’s a simple ergonomic touch that is complicated to engineer. Another detail, an electro-hydraulic bimini top that slides in and out from the sides for instant shade, is as useful and discrete as the hydraulic stairs. Other noteworthy details: The Mambo Arctic technical fabric on the lounges and sunbeds was created especially for Riva as a soft-touch upholstery that is also weatherproof. At the bow a polished, cast stainless steel covers the warning horn, a vintage tribute to past Rivas. Thoughtful details continue belowdecks. The interior is defined by an interplay of dark mahogany, lacquered hardwoods, dark leather coverings, and white fabrics. The sofa and ottomans in the saloon are covered by a special fabric created by Ivano Redaelli and wall-to-wall carpeting is from the Dutch company Van Besouw. 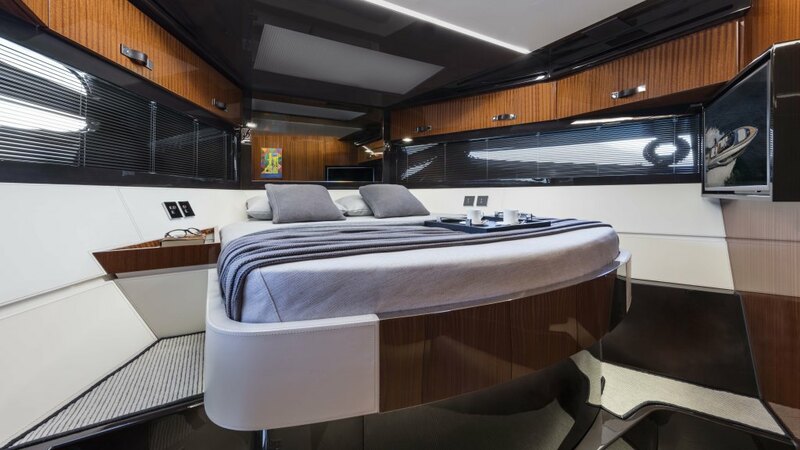 Beyond the deep richness of the saloon, the two en-suite staterooms employ a similar color scheme, including white-leather headboards and dark leather bedside tables. Ivano Redaelli also designed the cushions, bedspreads, and even the tartan blankets. 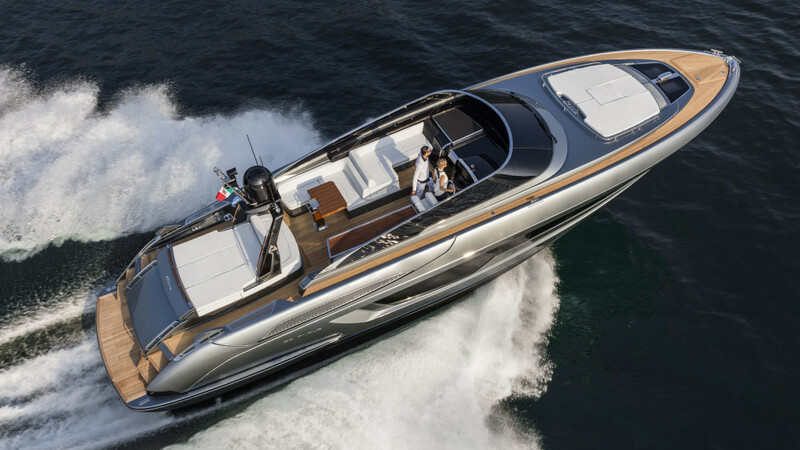 The Rivale’s twin 1,000 hp MAN engines provide a top speed of 35 and cruise speed of 31 knots. 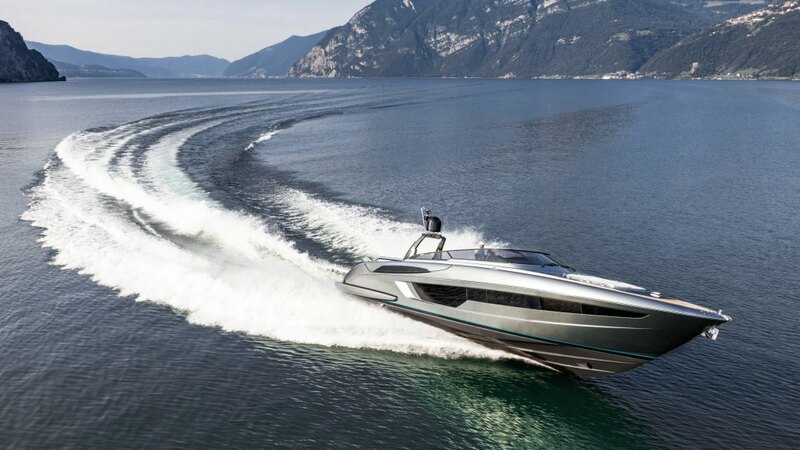 With twin 1,200 hp MANs, top end increases to 38 knots. The 56 has a crew cabin with bathroom with separate access. It can be replaced by a third guest quarter by owners who want to operate their own Rivale. 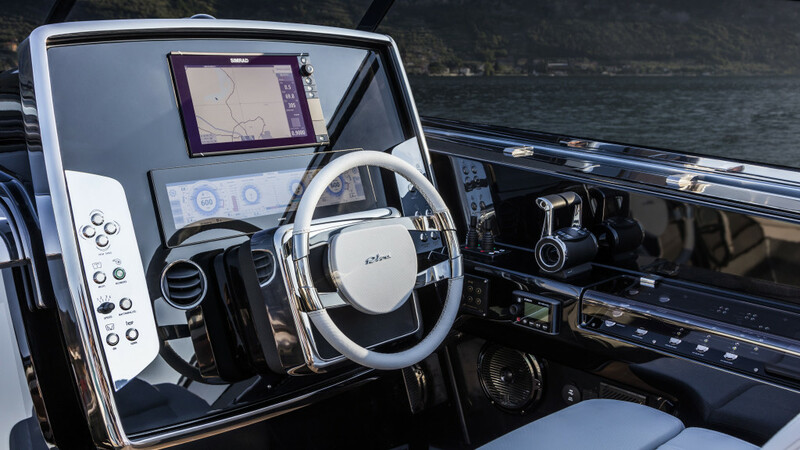 The yacht will make its official public debut at the Cannes Yachting Festival and Monaco Yacht Show.